Vanilla Ice Cream – Health Freaxs Unite! 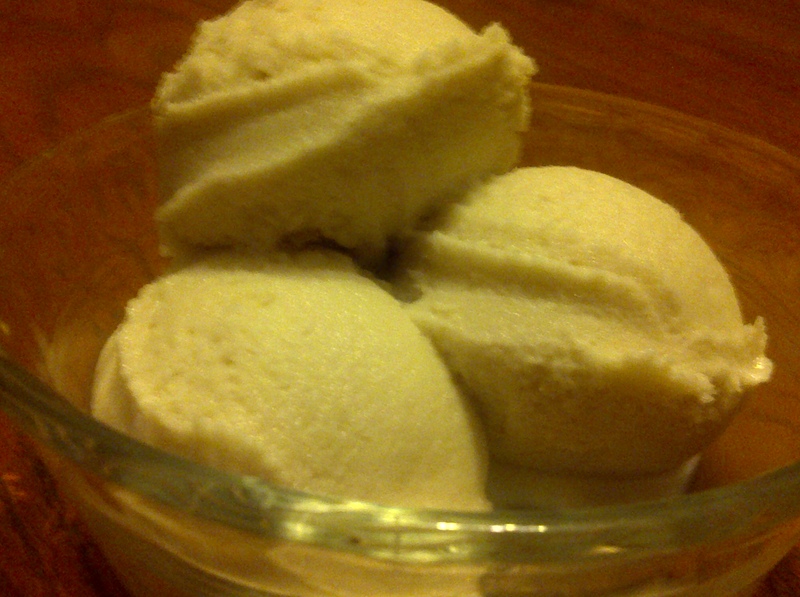 The Vanilla Ice Cream (pg 260) may be the best ice cream recipe i’ve had yet! If you guys read my Christmas post, you know that i got an ice cream maker this previous year. So an ice cream recipe to try it out on kind of got me excited! I’ve already made this recipe about 10 times, and have used it as a base for tons of delicious creations! I love how even with my extremely cold freezer that hard freezes about anything, this stuff still comes out smooth and creamy. Maybe its the coconut cream in it. Maybe its the silken tofu. Who knows? But whatever it is, it’s delicious! My favorite variation so far is the peanut butter one from the book. I also loved the time i added coconut, raisins, blueberries, chocolate chips, and walnuts to it. It sounds like an odd combination, but add a 1/2 cup of that mixture to it about 5 minutes before the recipe is done making, and it turns out awesome! But to tell you the truth, its delicious as it is or with just about any of the chocolate recipes in the book! Can’t wait to try the green tea variation! Kodak Moment: The look on an omnivore’s face after they’ve tried it and you tell them that there’s tofu in it! Follow me on Twitter or Facebook for updates on the Veganomicon Project!